1.) Salvation – ( the deliverance from sin and from the punishment for sin ) Christ is a Person and He can not be received in parts. If you have any of Him you have all of Him. You having all of Him does not necessarily mean He has all of you. It very well may take a lifetime to surrender your will, thoughts and emotions to God, although salvation occurs the instant you believe. 2.) Righteousness – ( doing what is right ) It is the quality of the believer who has heard the Word of God and has received Jesus Christ. Since you have heard and believed you have been made right and just in the sight of a holy God. Righteousness expresses the character of the believer. “We are all as an unclean thing, and all our righteousness are as filthy rags; and we all do fade as a leaf; and our iniquities, like the wind, have taken us away.” Isaiah 64:6 “For God has made Jesus to be sin for us, who knew no sin; that we might be made the righteousness of God in Him.” II Corinthians 5:21. 3.) Sanctification – ( set apart by God ) When an unbeliever receives Jesus Christ and becomes a believer, through the Holy Spirit he is removed from the kingdom of darkness and placed into the kingdom of God. The instant a person exercises faith in the finished work of Jesus, they are born into the family of God. “By the which will we are sanctified through the offering of the body of Jesus Christ once for all.” Hebrew 10:10 NKJV To be sanctified is to walk in the path of righteousness, separated from the world. 4.) Redemption – ( to release or deliver ) Christ delivered us from guilt, condemnation and sin. He took our place, He sacrificed Himself for us. It is not limited to the redemption we receive when we are saved. We are delivered daily from the power of sin, However we are redeemed instantly when we put our faith and trust in Jesus Christ. Redemption also points to the rapture, when the believer will be delivered from the presence of sin. 5.) 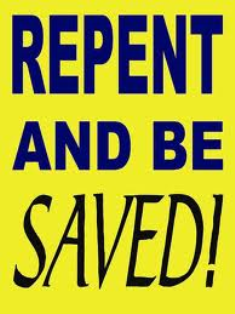 Repentance – ( feeling sorry for doing wrong ) Sin does a terrible thing to us. It makes us see the world wrong. It makes us see ourselves in the wrong light and it makes us see the pleasures of this world in the wrong perspective. We just do not see right when we are in sin. “If we confess our sins, He is faithful and just to forgive us our sins, and to cleanse us from all unrighteousness.” 1 John 1:9 NKJV. Becoming a Christian is no minor transaction. The beginning of the Christian life is no ordinary thing. For an unbeliever to become a Christian is God’s greatest miracle. This miracle begins when we believe in the scriptures and change directions from our sin. 7.) Atonement – ( bring God together again in friendship with sinners through the sufferings and death of Jesus Christ ) All that we are, all that we have, all that we enjoy as a believer, all we ever hope to be, all we ever hope to have is a result of the death of Jesus Christ on the cross. Even when we were hateful to Him, Jesus loved us. His promise is to go with us all the way, all the way to the end and finally to stand with us and confess us to God the Father that we are His. With such a glorious salvation in the person of the Lord Jesus Christ, abiding in us in the person of the Holy Spirit, we cannot lose.